Here is another one of those forgotten about older films that shine when brought out on a new wonderful outlet. Twilight Time has done it again in capturing how to treat a piece of cinema that should be expressed to every generation of film lover. Just in time for old blue eyes 100th birthday, Twilight Time has honored this film and created a truly fantastic and utterly brilliant transfer to this blu-ray outlet. This movie is one of those that have seen many times, and is always a treat to see again. Now I have the wonderment of checking this action, romantic war film on this beautiful blu-ray. I mean what really needs to be said, other than this stars the one and only Frank Sinatra. Also starring the splendid beautiful, stunning Natalie Wood. Also starring the one of a kind Tony Curtis. A brilliant ensemble cast of true classic excellence at its finest. The plot is simple and yet effective. Your two main characters Sam Loggins played by Frank and Britt Harris played by Tony are two World War 2 soldiers, both American who are in France. There the plot thickens as both fall in love with the same girl, Monique Blair (Natalie Wood). This is a wonderful complex relationship that unfolds. Monique has secrets. Both Sam and Britt want Monique as their girl, love interest, partner. This all comes together in a dramatic setting of war, love, decisions and truths. Directed by a truly amazing one of kind director who directed one of my favorite films 3:10 to Yuma, the master of film making Delmar Daves. Daves created so many great films, 1936’s The Petrified Forest, the stunning 1950’s Broken Arrow, 1959’s The Hanging Tree and so many wonderful others. He not only was a director, but also an actor and a writer. His expertise in film making is truly something to remember, and Twilight Time has honored this director. Now this is based on a book by the same name written by Joe David Brown. It was adapted into a screenplay by Merle Miller. Miller was an interesting man. He was not only a screenplay writer, but also a novelist and a gays rights spokesperson. He came out of the closet in 1971. His passion for words, public speaking and screenplay writing is something to remember. He didn’t write many screenplays, but the few he touched on with his writing expertise, stand out, and Kings Go Forth is a prime example of that gifted talent. His claim to fame is the adaption of Kings Go Forth and his controversial book, Harry S. Truman: Plain Speaking. I feel Miller had a talent and it shined in many ways, and for the one who loves cinema, they can see that spark in Kings Go Forth. One also has to mention the amazing cinematography by Daniel L. Fapp. Fapp captured brilliance in his long career working on such classic like West Side Story, The Great Escape, The Unsinkable Molly Brown, and many others. He surely knew what he was doing. Kings Go Forth shines with that knowledge. Not only does this star the wonderful likes of Frank, Curtis and Wood, but it displays a vast array of acting excellence. Character actors and wonderful performers that acted flawless for their time period. The very brilliant and under-appreciated Leora Dana. She was a fine example of what capturing characters on screen is all about. I feel looking back at her career, she never got the push she so deserved. Sadly, everyone involved with this movie in the acting reality of the film, have all passed away. Going into older films for movie lovers and cinema fiends like myself, it’s a little sad knowing these greats have passed away. Also starring the fantastic theatre, radio, film, television actor Karl Swenson. Swenson was and is everything a good performer strives to be. He left a career of pioneering wonderment. He performed great characters on radio and performed great characters on screen. I have many of his wonderful radio programs. I am a huge radio series lover, Inner Sanctum, The Shadow, and everything else. Swenson played one of the greatest characters Father Brown in, The Adventures of Father Brown. If there is a definition of actor it is Karl Swenson. Kings Go Forth also has a multi-talented beauty of cinema, the one and only Ann Codee. Most will have no idea who she is, but film historians and lovers of cinema as a historical art form, will know who she is. From the late 1920’s till the 1960’s she graced the cinema world both great and small. From TV to film, often at times uncredited and over looked but always a treat to see, hear, and watch perform. Often a character in the back grounds or even with no speaking role, but she shined and was perfect at what she performed. She plays the character of Mrs. Brieux in Kings Go Forth. She was and is and always will be perfection in no matter how small the role was. 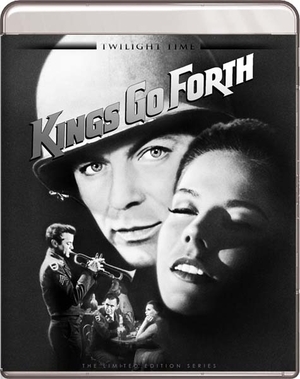 Another wonderful often overlooked and underappreciated actor Eddie Ryder is also in Kings Go Forth. Not only film but a huge TV guest star. He acted in everything from big budget films, to small screen TV flare. He like Codee was often side lined, or played a character in the background, but like Codee he gave his all. Kings Go Forth is an important piece to remember. A wonderful, different style World War 2 film that showcases a love story around a horrible reality of history. A dynamic acted film. Directed wonderful. The whole movie is a classic shining example of an older film that should be remembered, and thankfully companies like Twilight Time has done that with this beautiful product. As always I never find any fault in this reality. Twilight Time takes such care with their products that it’s a shining example of what other companies should strive to do. The sound is ear candy, the imagery is crisp and vibrant in the wonderful black and white tone of classic cinema. Slim Pickens on this one, but you get the important extra to me, the Isolated Music Score. The score is by one of the greatest musicians to ever live. Elmer Bernstein. He created throughout the years many wonderful pieces of music. A composer and conductor of many memorable pieces throughout cinema. His music film scores have always stood out. It’s a true shame to even say he was just a musician. His countless years of music love throughout cinema shines. From such amazing films as, The Ten Commandments, To Kill a Mockingbird, Ghostbusters, The Magnificent Seven, and many, many others. I could write a whole book on this man. His genius, his work, his sounds, his visionary expertise in the art form of music. This is a wonderful extra on this Twilight Time Blu-ray. A 1950’s classic. Wonderful story. Awesome performances. Dynamic music and melodramatic brilliance that only the classics displayed. A perfect Blu-ray of audio and video. A flawless transfer of this older film into modern technology. The movie looks new, fresh and perfect. Twilight Time did another lovely job in crafting a product worthy to own.